Like I promised, here is the first lesson from my "Mom's Missionary Training Center". 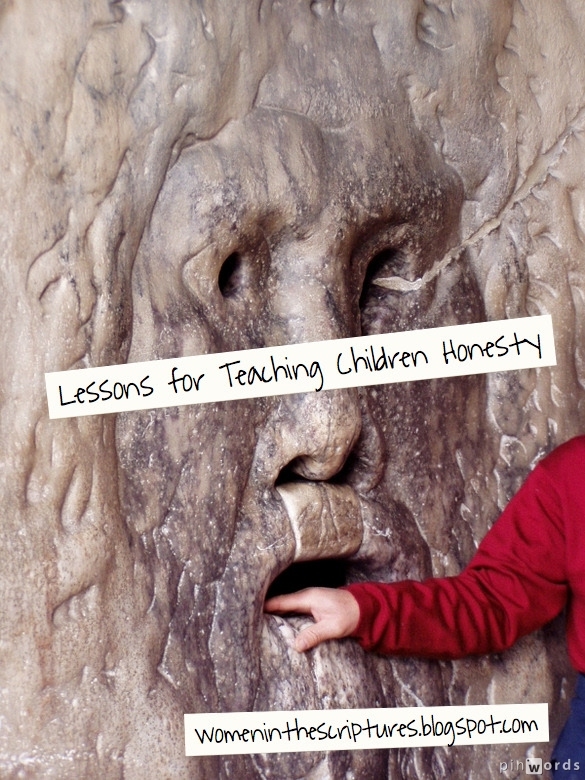 Honesty isn't one of the nine Christ-like attributes that is listed in "Preach My Gospel ( it technically falls under the "virtue" section), but I felt like my children needed some specific attention in this area. So depending on what your children need you could use some of these activities during the month you focus on "virtue" or you could use it separately like I have done. I have included a few scriptures and stories from The Book of Mormon but most of them are from the KJV Bible. Feel free to use as little or as much of this as you like and to adapt it to the needs of your family. These lessons are to be designed to be done every day (or every few days) for a whole month. Don't do all the stories and all the activities for the week in one day! The idea is that with constant exposure and repetition of the virtue (from several different angles) that kids will start to internalize the message. With my kids I have taught them the song and the scripture the first week and then work on those every day. Then I usually teach a scripture story, do an activity, or read a story book to illustrate the principle. I don't do more than one story or more than one example in a day, and if a lesson went really well I will sometimes repeat it again the next day. Usually the total lesson, with song and scripture, takes about 15-25 minutes. At the end of the month I have the kids do a "program" for their Dad, usually for Family Home Evening. In the program the kids sing the song they have learned, repeat the scripture, and each child shares something they have learned that month. Sometimes that means having Dad read them their favorite story book from that month, or dressing up and acting out a scripture story. It is also a time for them to share an art projects they have worked on that month. As far as the books go, I get all the story books from the library. I just request them all at the start of the month and since our library lets us check things out for three weeks we have them most of the month. I try to leave the stories I read on a special shelf and read them to the kids as many times as they request throughout the month. For scripture stories I usually find a picture online, save it on my ipad, and then hold it up while we talk about the story. The Gospel Art Book is also a good resource (though it doesn't have some of the more obscure stories) and LDS Church distribution center also sells packets of primary pictures that are helpful. Also, I don't play the piano and so I use this FREE app on my ipad (also works for an iphone) to play the songs, it works great. Though, if you have a piano player that would be better! If you have other questions about how we use this curriculum in my home let me know and I will do my best to answer them! or 1 Corinthians 13:6 " Rejoiceth not in iniquity, but rejoiceth in the truth;"
Ananias and Sapphira were greedy and kept back part of the money they said they would give the church. Not only were they greedy they were afraid to tell the truth and so both of them lied. Through the Holy Ghost Peter knew that they had lied and God dealt harshly with them. God won't always kill us every time we tell a lie, but He always sees us and we will have to be accountable before him someday. 1. What did Ananias and Sapphira do? 2. What happened to them because they were dishonest? 3. Why do you think they lied? 4. Does God always know when we are lying? 5. Do you think God only cares about big lies or do you think He cares about little lies, too? 6. Have you ever had anyone lie to you? How did that make you feel? 7. What can you do when you don't feel like telling the truth? * Ants are bigger than elephants. * We see with our eyes. * We hear with our nose. * Milk comes from chickens. * Take a cookie out of a jar and eat it. Then say, "I didn't eat the cookie." * Drop a toy on the couch. Then say, "Yes, I left my toy on the couch." After you demonstrate let each child have a turn coming up with their own statements and you respond with a "True" or "Not True" response. If your children grasp the idea fairly quickly then you could move on to the next part in the same game. If they are young and are still trying to grasp the idea you might just want to play this first part of the game for a day or two until the idea really settles in. Move on by saying, "You really can tell the difference between true and not true, can't you? Do you know what it's called when someone says something that's not true? It's called a lie." * Pick up a dollar on the floor. Then say, "I didn't find a dollar." * Give a bit of food to someone else. Then say, "No, I didn't eat all my food. I gave some of it to." For older kids you might also try telling half-truths and see if they can pick up on them. Let the children make up their own examples after you do the initial demonstration. It is best if you can use real examples that relate to your children lives, and the more crazy they are the more fun this game becomes! This is also a game that can be played at any time during the day when you find a good teaching moment. Set out a variety of treats on the table. Some good ideas include melted marshmallow, icing sugar, pudding, Oreo® cookie crumbs and melted chocolate with pretzels to dip in. Have all but one person exit the room. The remaining person may sample one of the treats. (With younger children it is wise to have an adult stay to supervise quantities.) When he/she has sampled one treat, he/she calls the others back in. Invite the others to guess which treat has been sampled. Note any deceptions the “sampler” has used, such as spilling some extra crumbs on the table to make others believe that they had actually sampled that treat. Take turns until everyone has had a chance to be the sampler at least once. Reviewing the following questions will help you share the concept with your children that no matter what we do, God is always watching. Take time to explain that even if we conceal our sin from others, God knows what we have done. 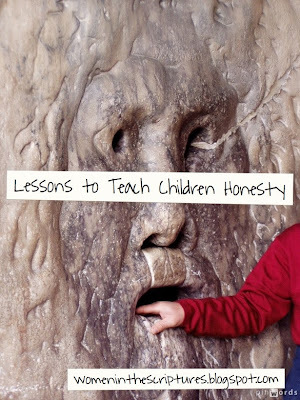 Let your children know that concealing truth is still considered lying. Choose one or more of the verses listed below to pray in closing. How could you tell what treat had been sampled? Even if we guessed wrong, who knows exactly what the sampler ate? Who, other than the supervisor, knows how much the sampler ate? Have you ever tried to cover up the truth only to find out that some little clue led your parents or teacher to the truth? Is it wrong to try and cover up the truth, even if you don't say anything? Can you lie without saying anything at all? Even if your parents or teachers never know what you have done wrong, who knows? Christ was perfectly honesty, even when it was hard. If he had told a lie the soldiers might have let him go but he always told the truth. Christ was like his Heavenly Father and Heavenly Father is always honest. Satan is the "Father of lies", he always tells us lies or half lies and so he can't be trusted. God always tells the truth and so we can always trust him to keep us safe. * Have you ever told the truth even when it was hard? * How did it make you feel to tell the truth? * Have you been stuck? How did it you get out? * How can we choose to be like Jesus? Show the kids a video of a spider catching a fly in its web, or if you are able to go outside and find a real spider web with a fly in it is even better. * Is the bug happy? * Do you think the bug wishes it had never flown into the web? * Will it ever get out? * Who could get it out? * If you lie, who can help you get out of it? * Have you ever lied? * Did you end up wishing that you never had? * If you do get trapped in a lie, who should you go to for help? Explain to your kids that Satan is like that spider. He wants us to be people who do not tell the truth and become entangled in lies. Our lies keep us from being free and often get bigger and bigger. 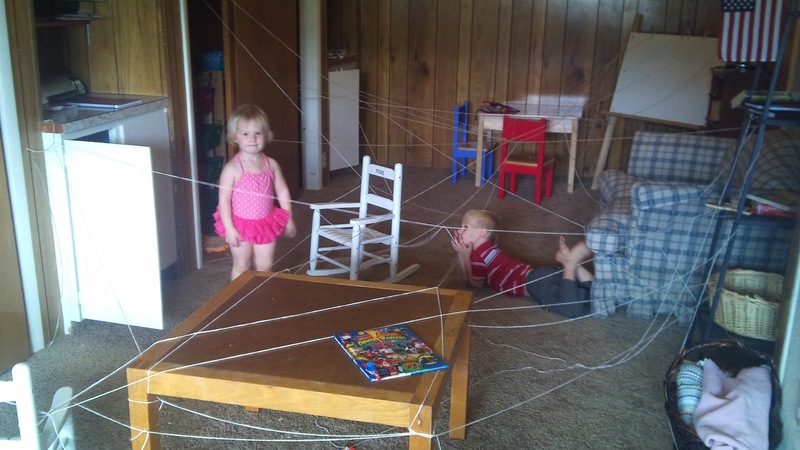 Later that day, or the next day, make a spider web with yarn in your room. Place a prize or a treat at the other end of the web and then have them navigate through it. Let them do it as many times as they like. Afterwards talk to them about how when we tell lies they entangle us and make it harder for us to reach our goal of becoming like Jesus. My kids wanted the spider web up all day, they loved playing in it! If your kids are older you could have them re-wind up the yarn and talk to them about how it is much harder to undo a lie, than it is to just tell the truth in the first place. 1. Have you ever taken something that didn't belong to you? 3. Did you give it back? 4. What did Achan do? 5. What happened to Achan? 6. Even if you think no one is watching when you take something that does not belong to you, who always sees you? Zoram gave Nephi his word that he would not betray him and that he would stay with him, because Zoram kept his word he was blessed. We also need to keep our word. If we tell someone we are going to do something we should do it. Have you ever promised someone that you would do something? How did Nephi know that he could trust Zoram? Can people trust you if you tell them you will do something? How does it make you feel when someone tells you they will do something and then they don't do it it? Start this role play by pretending to make a bad choice( ie. you pretend to be at the grocery store and you sneak a candy bar). Go back and be excited about what you have and see if you can get the kids to go back and do it with you (hopefully they will say "no" if you choose something obviously enough wrong). Pretend to have dilemma about whether or not you should tell the truth. Bring up all the reason why you shouldn't (you'd have to give the candy back, you would be embarrassed to take it back, you are afraid you will get in trouble). Have the kids counsel you on why or why not you should tell the truth. Depending on what they tell you re-enact the consequences . For example if they tell you to not the tell the truth show how next time your mom doesn't trust you at the store, and how your heart feels sad. If they tell you to tell the truth pretend to tell it and show how after that your mom trusts you more and you feel happy. Stress the point that even though it may be scary to tell the truth, that in the end it is always better. After you have done the role-play once let the children have a turn leading it. While you are driving in the car (or throughout the day) tell your kids something false, such as “Hey, look at that horse running down the road.” Do it again a few blocks later, and yet again another few blocks down the road. Did you think it was funny when I mentioned the horse? Would it be funny the second time? What if I told you untrue thing like that all the time? Did you stop believing me about the horse? If you tell stories that are not true, even just to be funny, will other people trust what you say? Can you think of a dangerous situation that might arise if people realized that they can't trust what you say? Christ warned Peter that he would betray him and deny him. Peter didn’t think he would but he feared for his safety and he denied him three times. Afterwards he felt really bad about it. Sometimes we are tempted to lie to make things easier for ourselves, but we should always tell the truth. Christ visits Peter after is resurrection and because Peter is sorry for what he has done Christ forgives him. We need to forgive others just like Christ forgives us. Have you ever told a lie and then felt bad about it afterwards? Is it ever okay to lie, even to protect yourself? Instead of lying what should Peter have done? How did Christ forgive Peter? For this experiment, you will need a small bowl of water, a pepper shaker, cotton swabs (the double-ended stick swabs), liquid dish detergent and some additional water. Prior to beginning the experiment, coat one end of the cotton swab with dish detergent. Leave the other end free of soap. Mark the soapy end in a way that only you will know which end it is. Shake a generous amount of pepper onto the surface of the water in the bowl. Explain that the pepper represents people. Tell your children that the cotton swab represents God. Put the non-soapy end of the swab in the water and move it around to let some pepper gather on it. Explain that when we are truth-tellers, God will allow us to come into His holy presence. Next, tell your children that the people in the bowl have been lying. Ask them to list some ways the people could be telling lies. Then place the soapy end of the cotton swab in the bowl and watch the pepper flee! Explain that when we have been lying, God doesn't want us in His presence, nor do we feel comfortable coming to talk with Him until we have confessed our sin. Finally, using the non-soapy end of the cotton swab, swish the cotton swab through the pepper, showing that the pepper no longer “runs away” from the cotton swab. Emphasize that after we have confessed our sin, God welcomes us back into His presence. 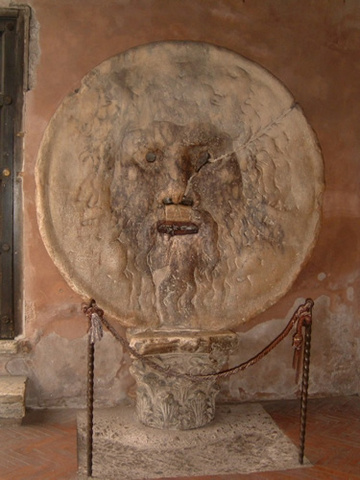 Show children a picture of the Bocca Della Verita (the mouth of truth). Show them where Rome is on a map and explain to them people travel from all over the world to stick their hand inside of it to see if they are telling the truth. Stress the fact that it is just pretend. Talk about how even though the statue is just pretend it reminds of how important it is to tell the truth. Telling the truth keeps us safe and happy, while telling the truth traps us and makes us unhappy. Have the children make their own Bocca Della Verita out of plaster, clay, or paper mache, or whatever you can think of and decorate it. OH my, you've done a great job with this. Do you mind if we play along...? Wow, Heather, you have done so much work. Incredible. I don't know if you're familiar with the Power Tales/Power Tunes, but we like their stories and songs. There's a good book called "The Power of Integrity: Featuring the story of J.C. Penney" and then a cute song that goes along with it in the Powertunes CD. Amazing job, Heather! I hope you don't mind my linking to it in a post over a Latter-day Homeschooling later today. Truly amazing! Thank you for sharing. I second the Power Tales/Power Tunes suggestion. It would go perfectly with these lessons. Yes! Perfect timing! I do PSR work in Idaho. It means Psycho Social Rehabilitation and I've got a kid with lying problems. I will be able to use some of these! Thank you so much for posting this! I have been following your blog on and off, and I love learning from all of your wisdom and insights, but this is just exactly what I needed right now. I have been trying to have gospel lessons each day with my wee ones recently, and I am so happy and grateful for the ideas and resources that you have put up here. Thank you, thank you, thank you. Please continue to post these! This is a great outline and I appreciate all the work you've put into it, Heather! The only thing that gives me pause - and it may just be an awkward wording - is in the last activity with the cotton swabs, soap and pepper it says, "when we have been lying, God doesn't want us in His presence." I don't think it's ever accurate to say God doesn't *want* us with Him. We may make choices that distance us from Him or make it difficult for the Spirit to get through to us, but He always wants us. Yes, the Kids of Integrity website is an evangelical based one and I love their resources and ideas but there are definelty somethings that aren't in line with LDS beliefs... but feel free to adapt them however you want! I think the basic idea of this is great but the wording could be changed. Thanks so much for creating this! I intend to start using these ideas in our homeschool day. Thanks! I don't know anything about computers, but is there any way to make this into a PDF for easy printing? You've really gone to town, with all your hard work! :o I'm impressed. Do you mind mentioning how old your eldest is and whether your kids have any difficulty with some of the archaic language stuff? The quotes right at the start (rejoiceth, etc) remind me of last Easter, when I was desperately googling for resources to explain the cross, etc, in child-friendly ways. My two could not get to grips with any of the ye olde language type stuff. (I thankfully found some children's cartoons on Youtube, that worked for us.) Actually... come to think of it, it also reminds me of having to study Chaucer at school. *shudders* Definitely a language barrier thing, for me. We use the KJV of the Bible and I have found that even though the language is hard to understand at first, after awhile the kids get use to it. We stop and explain a lot about what words means and make sure the kids get what they are reading. Personally I like the KJV of the bible the best, it is beautiful and the more you read it the easier it becomes to read. Sometimes I use other versions of the Bible if I am having a really hard time understanding what a verse means. Personally I really want my kids to be familiar with the old English (so they can read things like Shakespeare and get it) and I think reading the KJV from the time they are babies helps a lot with that. But I don't think it hurts to use a different translation of the Bible, it just depends on what your goals are for your kids! This is really, really great! I used just one printed page for FHE tonight and we got a lot of discussion about it. My 6 y.o. said, let's do another lesson!! It was so cute. Lots of good prep work on your part. Thanks. Thank you so, so much for sharing this, Heather! I've really been wanting to do something like this with my own kids. Mine are a little older than yours (starting at age 8 down to 1), and we've been studying the Gospel Principles manual for a while. That's been useful, but I've been thinking I wanted to do a more targeted study of virtues and Christ-like attributes - I just felt overwhelmed by the prospect of putting it all together. So, again, I REALLY appreciate you sharing your work for so many of us to use and bless our own families. This is amazing!! Thanks so much for sharing. I love these ideas. I don't have little ones at home anymore, but I'll be sending this on to my children to teach to my grandchildren. I would make one small change. In the pepper, water, and soap part of the lesson, I would tell the children that when we lie we flee away from God so that we aren't near Him anymore. (I'd skip the idea that Heavenly Father doesn't want us near Him. He always wants us near Him, but our actions don't always allow us to stay near Him.) When we repent, we come back to Him and we are both happy. Wow!!!! 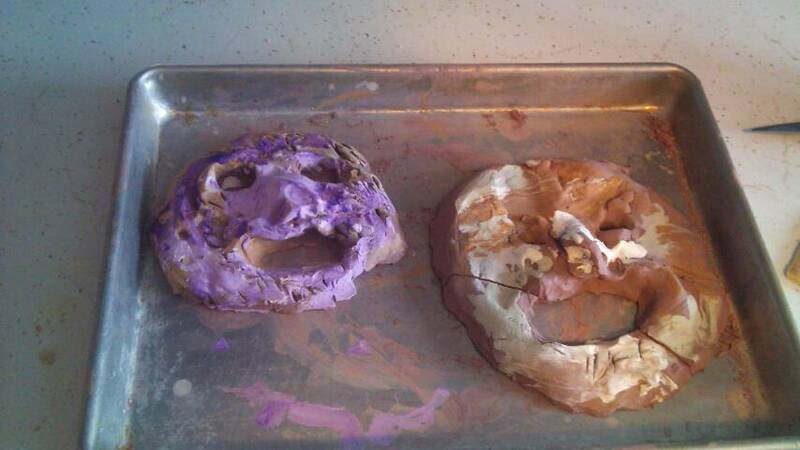 I just found your lesson plans through Pinterest. This is just what we've needed. Thank you for taking the time to post this, since it will save me hours!!! I just found your blog on pinterest.... THANK YOU!!!!! I also homeschool my children, 9,6 and infant :) I have been pondering on what to do to with preach my gospel and how to incorporate character studies. My daughter has fallen in love with the ValueTales books but I REALLY wanted something focused more on Christ. THIS IS PERFECT!! Thank you for all of your hard work on this, I am starting tomorrow morning! I have been pouring over these lessons and I am so grateful to have found them. Are you going to continue with this series? !